1.5 oz pot shown for illustration. 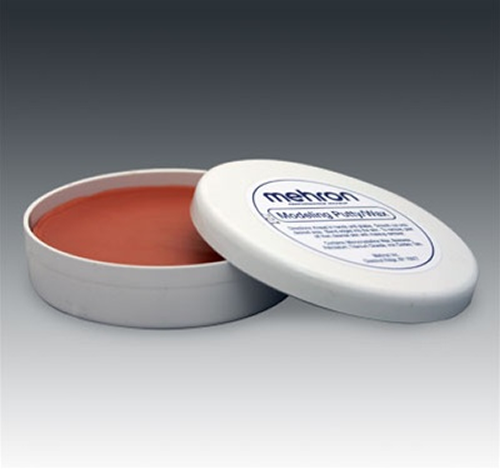 Modelling Wax/Putty developed by Mehron is used by Special Effects Makeup Artists to create 3-dimensional effects for character makeup. Mehron has developed a new softer formula that gives their Modelling Wax/Putty greater flexibility and is easier to use when creating finer details. Modelling Wax/Putty can be applied using Spirit Gum or Fixative "A", another Mehron exclusive. This Modelling Wax/Putty is used throughout the entertainment industry by Professional Makeup Artists and Special Effects Artists because of its moulding ability. The new formula developed by the Mehron Research Team makes Modelling Wax/Putty a great product for aspiring Special Effects Artists. Drama students and Drama Teachers love using the Mehron Modelling Wax/Putty to bring the Professional Touch to their productions. Microcrystalline Wax/Cera Microcristallina/Cire microcrystalline. May Contain [+/-CI 77489, CI 77491, CI 77492, CI 77499 (Iron Oxides)].